Leaked screenshots purported to be from an internal build of Windows 10 have hit the web, revealing some of the subtle but important changes Microsoft has made since releasing the most recent technical preview. 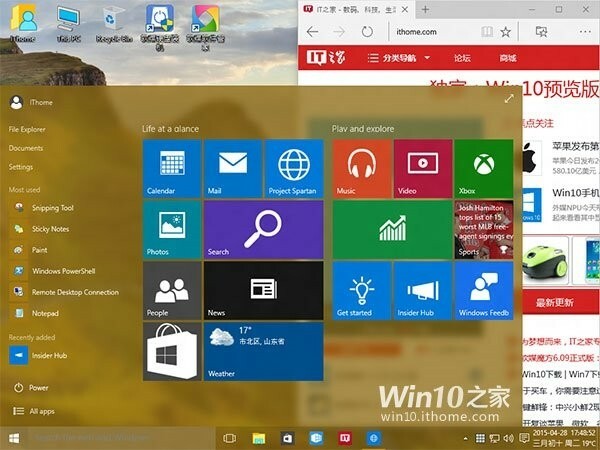 The return of the Start Menu is one of the most anticipated features of Windows 10. The leaked screenshots from build 10102 reveal Microsoft has added a transparency effect to the pop-up menu, similar to Aero Glass from Windows 7. This effect doesn’t extend to app windows nor is it present when the Start Menu is expanded full screen. Microsoft also appears to be moving away from the flat Metro-style flipping Tiles previously used. The new method is animated with a 3D flip effect. As The Verge points out, it’s a subtle change but one that matches the pop-up effect of the Start Menu itself. Screenshots further reveal a tighter Cortana integration. Specifically, there’s now a hamburger-style menu that can be used to access settings and options. Once opened, they expand out from the left. Microsoft’s annual Build conference for developers kicks off tomorrow and runs through May 1 in San Francisco. We’ll no doubt learn a lot more about Windows 10 and Microsoft’s other platforms over the coming days. The company hasn’t revealed when its new OS will launch outside of a broad “this summer” timeframe although AMD CEO Lisa Su recently let slip that it’ll be released at the end of July.